Uploaded by MilesChemical< Stripping E-coating from Aluminum with Miles Chemical Solutions, E-coating Removers & Powder Coating Strippers . Powder Coating Stripper Brush-On Type: Paint Stripper (Thickened) Room Temperature Paint Stripper #8649, 100% Brush-On Room Temperature, let set on surface 1-3 hours. None Eco-Powder Stripper OxyStrip, Brush-On Type: Paint Stripper. Creamy Thick use at Room Temperature let set on surface 1-3 hours. Note: Paint Stripping time is 15 to 30 minutes with most production paint film builds. We recommend utilizing 3%-5% by volume MILES #8635 Evaporation Inhibitor Blanket Solution to preserve chemical and reduce evaporation with MILES #8626 and MILES # 8612 Strippers. MILES #8641 is an eco-friendly: green, multi-metal safe concentrated paint stripping solution formulated to (use with up to 50% water) to de-laminate cured coatings including: powder coating, e-coating and wet-applied cured coatings from aluminum, zinc, magnesium, brass, stainless steel and steel substrates. #8641 can be used to clean racks daily and recycle paint rework. MILES #8641 Utilize an immersion tank with lid, polypropylene-evaporation inhibitor-floats, ventilation and a mixer. Charge and maintain (replenish solution-loss) with 50% conc. #8641 and 50% water. Heat to 185F., immerse parts for 30-60 minutes or until coating is completely delaminated. Pressure-rinse parts with water and dry for reprocess. Use 5% of #8644 by tank volume, as required to maintain pH below 4.0, to maintain optimum stripping performance. Provide us with a purchase order for a 1-gallon or 5-gallon sample container at $34.85/gallon, plus $20.00 UPS -shipping, to test at your facility. MILES#8612 ECO-POWDER STRIP-RTU is a ready to use (add no-water), eco-friendly: green, multi-metal safe paint strip solution formulated to dissolve cured coatings including: powder coating, e-coating and wet-applied cured coatings from aluminum, zinc, magnesium, brass, stainless steel and steel substrates. Used in conjunction with #8635 Evaporation Inhibitor at 5% concentration. DESCRIPTION: MILES#8648 AMBIENT POWDER STRIP-THIN is a paint strip solution formulated to under-cut: de-laminate and remove Powder Coating from Aluminum and Steel paint rework. #8648 can be used to strip Aluminum Wheels and e-coat racks: e-coat paint rework when HEATED. MILES#8648 AMBIENT POWDER STRIP-THIN Utilize a stainless steel or polypropylene immersion tank with a lid, ventilation and a mixer. Immerse powder coated parts & hooks in MILES-#8648 at 50% concentration with water at 150F. to strip powder coated aluminum wheels and powder coat rework parts: remove powder coating in 15 to 20 minutes per 3 mils cured powder coating. Utilize-polypropylene-evaporation inhibitor-floats to reduce evaporation and replenishment requirements, save on chemical, dollars and extend solution bath life. A pressure (1800-5000psi), water rinse is normally recommended when utilizing under-cutting: de-laminating technologies. 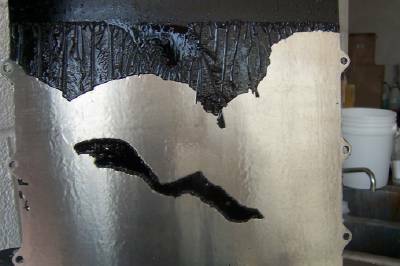 The Benefits of under-cutting: de-laminating paint removal process solutions are many, including: easier to remove coating sludge in-sheets, resulting in longer bath life, lower operating cost, utilizing up to 50% water in the process, safer less hazardous for the operator and the environment. or Utilize MILES #8648, 100%- neat at ambient room temperatures for 1-3 hours for cast aluminum and overnight for steel paint hooks. For (e-coat removal, utilize #8648 heated only) at 50% concentration with water at temperatures of 150F.-185F. Strip time is 10 minutes to 15 minutes. Provide us with a purchase order for a 1-gallon or 5-gallon sample container at $34.85/gallon, plus shipping, to test at your facility. MILES #8649 Thickened, Brush-on, Room Temperature Stripper. MILES #8649 is a (thickened), stripping solution used as received; strip time is usually 1-3 hours at room temperature. The loose coating can be removed with a spark-less scraper, disposable cloth or steel wool pads, and then rinse with soap and water, dry and reprocessed through the paint or powder coating. The MILES #8649 is $34.85/gallon plus UPS shipping & handling cost, which is $20.00/gallon plus an additional $24.50/gallon-material handling charge, due to the acidic pH-base, which helps to penetrate the coating. Total 1-gallon sample of MILES #8649 plus shipping. Excellent for Wood Refinish Projects / Home and Construction Paint & Varnish Removal Applications/ Indoor and Outdoor Paint Stripping Uses / Stays Wet & Active up to 24 Hours / Easy to Use Fast Acting Gel, Clings to Vertical Surfaces / Contains No-Hazardous Methylene Chloride or Flammable Solvents, Pleasant Scent. OxyStrip eco-friendly stripping solution, an alternative that actually works better than the current technologies offered as safe strip products. OxyStrip is a non-methylene chloride product, based on oxygen to accelerate coating removal performance. OxyStrip and is available by visiting: http://www.mileschemicalsolutions.com/Oxy_Strip_1.htm on the web. The product will remove all types of house paint and varnish from wood and metal surfaces and is non-regulated for shipping and non-hazardous, it has little to no-apparent odor, is thickened to hold to vertical surfaces and will not evaporate as fast as many other products available in today�s market place. The use of chemical resistant gloves and safety glasses is recommended for all chemical applications, do not utilize latex rubber gloves with OxyStrip. 1-gallon of OxyStrip can cover up 100-200 square feet and is economical compared to the products sold in smaller quantity containers on the store shelf. Provide us with a purchase order for a 1-gallon or 5-gallon sample container at $29.95/gallon, plus UPS $20.00 shipping, to test at your facility. Strip Paint: Remove Powder Coating & Recycle Paint Finishing-rework, with MILES Chemical Solutions Powder Coating Stripper, Obtain a Second Chance, at First pass (zero) 0-defect Quality. Remove e-coat, strip powder coating from hooks, racks and fixtures with our metal paint stripper. Eco friendly paint stripper & Green-powder coat stripping solutions to remove paint & strip powder coating. Safely strip paint from aluminum: remove paint from zinc/magnesium/brass/stainless/ferrous and plated metal substrates with our Nonhazardous, Powder Stripping Products. Additional offerings: Aluminum Paint Strippers, Paint Removal Products, Paint Stripping Service/Coating Removal Service. Aluminum Wheels can be safely, chemical stripped at low temperatures with MILES Chemical Solutions #8648. 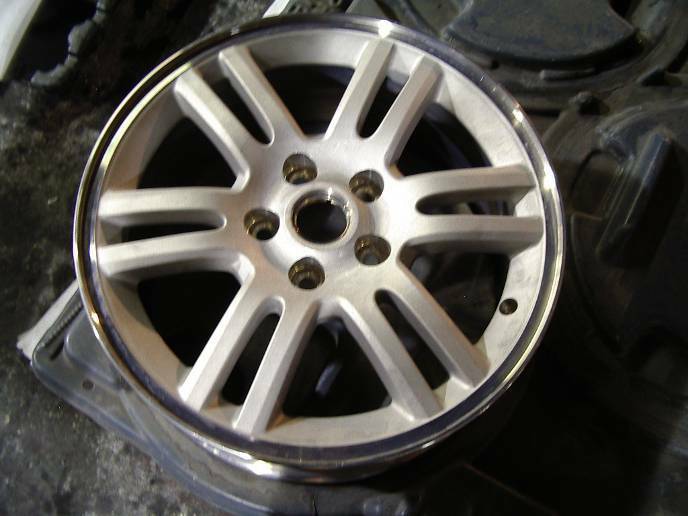 The Aluminum Wheel can be reconditioned by removing the old coating with MILES Chemical Solutions #8648 in approximately one hour and then re-coating the aluminum rims with durable powder coating. Visit The Powder Coating Industries Latest Directory Place your company at the Top of your States Category Today! Paint Stripping Services: Miles Chemical Solutions | Copyright � 1999 [Miles Chemical Solutions] | All rights reserved.